In compliance with the articles 5162 and 5170 of health regulation. Large warning labels in compliance with ISO 3864, 92/58/CEE European directive and NF X08.003 norm. Tested and approved by MPA DRESDEN laboratory. Economic solution for dangerous products storage. Easy sight of the stored products thanks to glazed doors. Available in 2 versions, for toxic products or for noxious products. White epoxy paint RAL 9010. "Toxic" or "Noxious" large warning labels. 3 adjustable shelves in height. 1 removable retention base trough at the bottom (180 mm high). High opening vent Ø 100 mm with connecting piece for possible exhaust. 4 mm thick glazed door(s). Handling door(s) with key-locking system. WARNING! 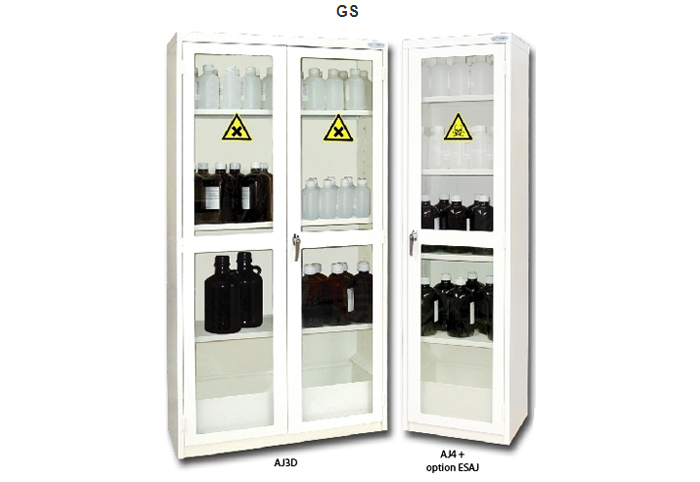 For safety reasons (chemical reactions between incompatible products) the different product families must be stored separately. The manufacturer keeps the right to modify technical characteristics without notice. Edition 02/2008.